Purchase your ErgoGlide® with a Credit card simply by calling Ergo Pros directly or use the Paypal shopping cart below (you do not need to be enrolled to utilize this service). ERGOGLIDE® SAND COLOR may vary slightly from images below. Paypal securely processes your order with a credit card, you do not need to be enrolled with PayPal to utilize this service. This Paypal method can be used 24 hours, 7 days a week. Ergo Pros accepts MasterCard, Visa and Discover via phone. Operating hours are Mon-Thur 9:00 am to 5:00 pm EST. Ergo Pros accepts Purchase Orders upon Net terms and approval. Purchase Orders can be emailed to ergopros@gmail.com, or call Customer Service at 207-571-9258 Mon-Thur (from 9:00 am to 5:00 pm). 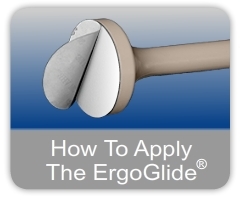 For ErgoGlide® orders of 48 or more, please call to place order with a specialist for detailed shipping information. What length ErgoGlide® is right for me? best for your office setup. 3" Length: Great to have a handle to grab onto. Helps with gliding motion. 6" Length: Provides comfort at a minimized reach. 9" Length: Best Seller, Receive Optimal Comfort, Maximum Length available.